The Medi Mediven Elegance Class 1 Black Below Knee Compression Stockings are compression stockings from Medi, one of the UK's leading compression stockings manufacturer. The contoured heel in the Medi Mediven Elegance Class 1 Black Below Knee Compression Stockings ensures a wrinkle-free fit for comfort and attractiveness. It also features a double heel reinforcement which makes the Medi Mediven Elegance Class 1 Black Below Knee Compression Stockings even more comfortable. The Medi Mediven Elegance Class 1 Black Below Knee Compression Stockings features Clima Comfort, which reduces sweaty feet and stops skin from drying out. Clima Fresh keeps the stockings fresh and hygienic by preventing fungus & bacteria from sticking around. 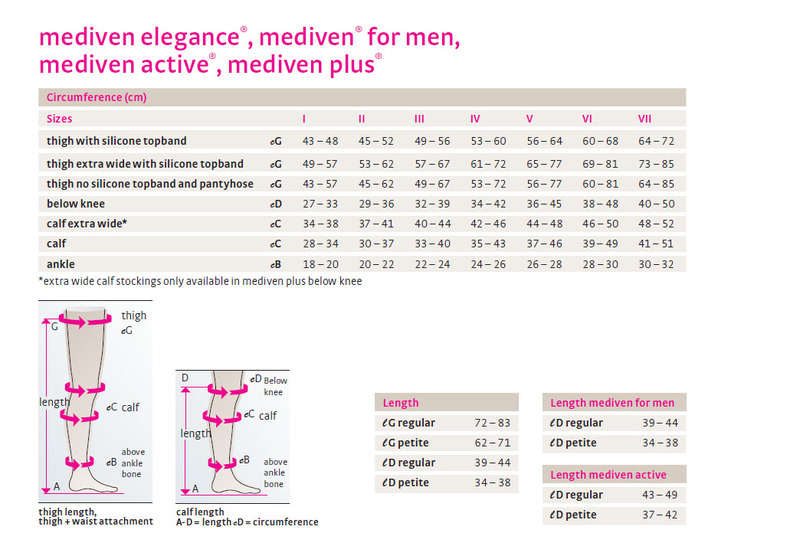 Medi Mediven Elegance Class 1 Black Below Knee Compression Stockings are non-returnable and non-refundable on grounds of hygiene.